As I write this we're in the middle of a wonderful week with 7 children (all girls!) 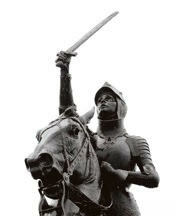 from Cape Ann who are exploring Joan of Arc's life and legacy. From the springboard of the Anna Hyatt Huntington statue that is only a stone's throw from St. John's Episcopal Church on Middle Street, Kristina Martin and I have adapted music from a variety of sources that tell the story of "Jeanne." Dramatist Jay DiPrima has led the girls on an exploration of the story creating tableaux, as well as letting each camper explore her own feelings about this remarkable life. Pastor Anne Deneen (from St. Paul's Lutheran) has been guiding the participants in an art component called "Soul Collage." Rose Sheehan, Education Director at Gloucester Unitiarian Universalist Church (Meeting House) is teaching sword dancing to the group, and Mark Nelson (St. John's) has been exploring the world of bells (and chimes) with the girls (bell sounds were one of the triggers that inspired Joan's visions). By the time you read this we will have visited the iconic equestrian statue and the carillon at Our Lady of Good Voyage Church, but what I want to urge you to do is to ATTEND OUR PROGRAM THIS FRIDAY at 11:30 to see and hear what we have accomplished. Everyone is welcome....especially children who might be inspired to attend next year's camp.